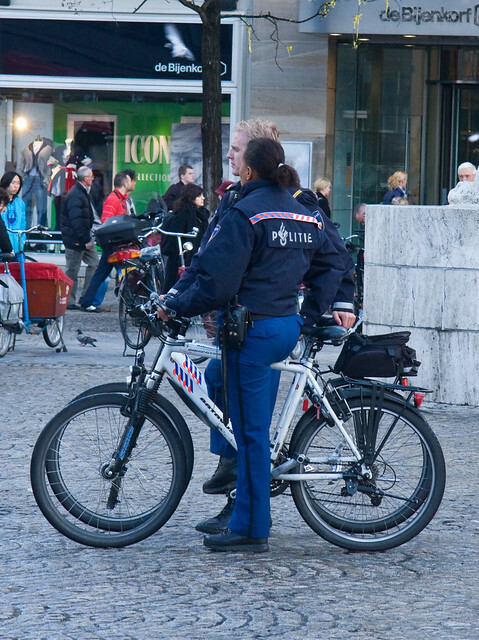 Here are two bicycle police officers in Amsterdam on my recent visit. I went over after taking the shot to ask them a couple of questions. They were extremely sweet and friendly - quite a contrast to the Danish bike cop I tried to engage in a conversation a while back. I asked them how many bicycle coppers there were in the city and they said that there are always 12 on the streets. I asked them if they ever wore helmets and they just laughed. I was struck by the difference between these very human and accessible enforcement officers and the guerilla warrior look in Copenhagen. I was curious to hear if Amsterdam still had beat cops - police patrolling on foot - and they said that they did. Isn't that lovely? Beat cops walking about the city? Isn't that a fine little detail in the life of a liveable city?